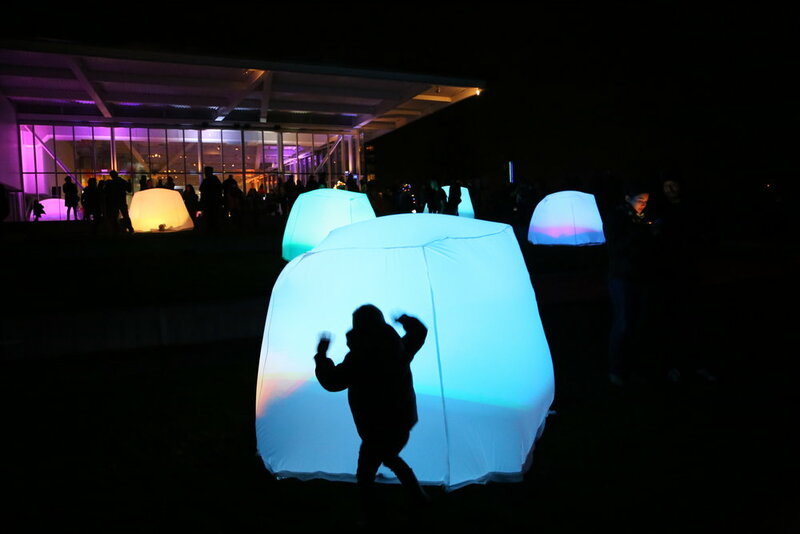 Last week we attend SAM Lights at the Olympic Sculpture Park. This is something I have wanted to experience firsthand for awhile now so I was excited to check it out with my family. SAM Lights is an illuminated celebration filled with interactive experiences, a roaming brass band, and a wishing tree to name a few. We spent a fun filled hour or two wandering through the displays and enjoying this unique take on holiday lights. Our favorite display were these glowing cubes. From a distance they looked like little tents all aglow. Once you got up close to them each time you touched them they changed a different color. Needless to say perpetually hitting anything is a toddler's dream so Jasper was pretty happy to run around banging on them over and over again. It was a beautiful, clear, Winter night in the city. I want Jasper to lead a rich, diverse life and exposure to art at a young age is something I really value. During moments like these I am grateful we live so close to the city that we can enjoy all it has to offer with such frequency and ease.